From Krassner to Kosuth to Poe | Jon Katz, P.C. I always look beyond the law and lawyers on my road to improving myself as a person, lawyer and persuader. Most jurors and witnesses are not lawyers, which makes it all the more critical for trial lawyers to expand their horizons well beyond the law. Last year, I posted a short list of people who inspire me to continue striving for personal excellence. I add to this list John Coltrane, who during his short life was ever-focused on expanding his creative horizons and on improving as a musician. I also add https://katzjustice.com/the-inspiration-of-frank-zappa/ and Daniel Schorr, who briefly collaborated together. I also add comedian Paul Krassner, who came to my attention when he did stand-up at the 1990 NORML conference in Washington, D.C. Among other things, he spoke about his time with Abbie Hoffman. Even though my last of a handful of joints had been smoked before law school, I felt less isolated in this NORML conference crowd from my then-corporate law firm where I sat in uncomfortable and stunned silence at lunch with two more senior law firm lawyers who praised Bush I’s invasion of Panama, and where later I frequently visited the anti-Gulf War I protestors at Lafayette Park at lunchtime, when a lawyer in the neighboring office had a yellow ribbon on his desk, which I had assumed (correctly or not) was the general mood at the 25-lawyer law firm that I left in 1991 to start my criminal defense career at the Maryland Public Defender’s Office. Already on my list is conceptual artist Joseph Kosuth, who came to my attention through his 1992 Hirshhorn Museum exhibit entitled “A Play: The Herald Tribune, Kafka and a Quote.” Kosuth’s underlines to me the importance of thinking outside the box. Instead of creating paintings, Kosuth juxtaposes existing art and creations, and focuses people’s attention on words through putting them in neon. At least thirty-five years ago, he created “One and Three Chairs”, in which he juxtaposes a chair, a picture of the same chair, and a definition of the chair. I also add to my list Edgar Allan Poe. Although I have far to go in reading Poe, I already value him as an envelope pusher along with fellow Baltimore-based envelope-pushers Frank Zappa and John Waters, who respectively spent a few years and many years in Baltimore. 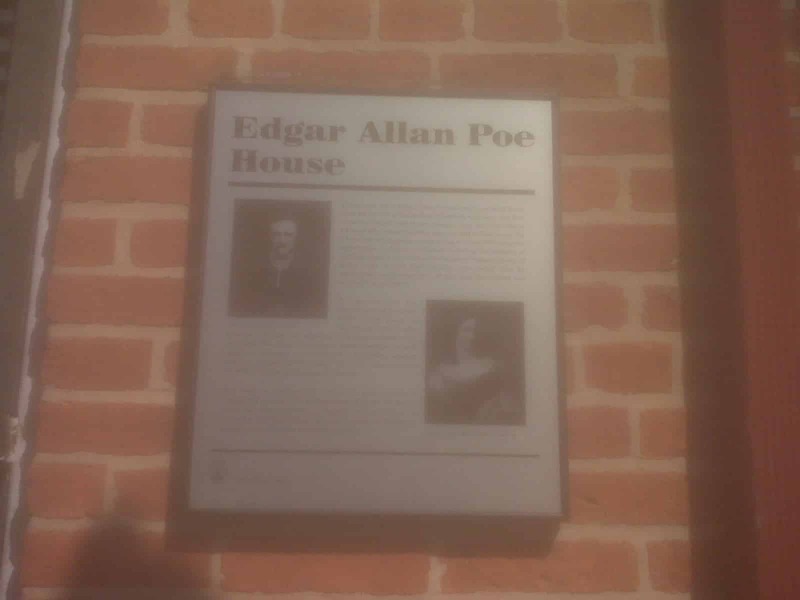 Poe spent several years in Baltimore and numerous other places. He passed away in Baltimore, and is buried there. After sixteen years of seeing the sign to his house in Baltimore, recently I finally went. Poe’s rowhouse was nothing remarkable at the time he lived there, being one for homebuyers of modest means. Other than Poe’s house, the neighborhood looks unremarkable, and is easy to miss, having only a small plaque and sign on it. As I was leaving Poe’s house with my son, another visitor asked how safe certain neighborhoods are in Baltimore. I could not resist commenting how stimulating Baltimore is, for the good, bad, ugly and in-between. One of the two staffers at the house said that the neighbors look after them, or else the staffers would not be there. There’s a Kosuthian juxtaposition: Poe, Kosuth, Krassner, Zappa and Schorr all meeting in the same room, including pictures and defintions of the chairs they sit in.